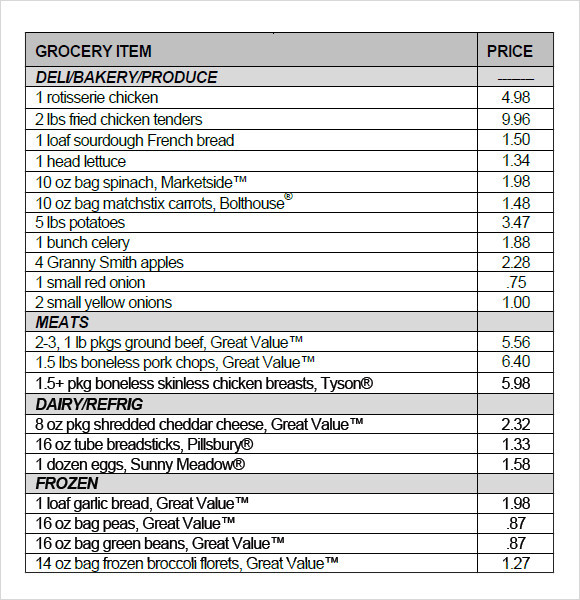 Enlisting all groceries that have to be brought can be very hectic so when it comes to comparing prices of different vendors and sellers to stay within your budget a perfect format has to be adopted. In general a grocery Sample List Templates has blocks specified for personal care, kitchen necessities, veggies and fruits, dairies etc. 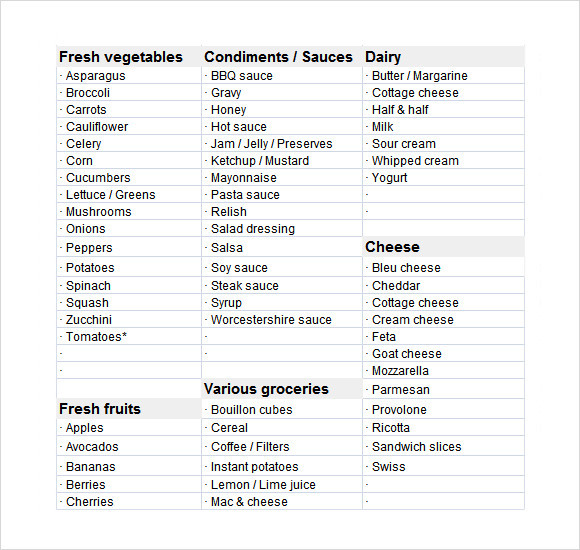 This sample of blank grocery list is a rather simple and pretty looking sample. It is available in Pdf format, which makes it incredibly easy to download and print. The list is divided into three different columns. 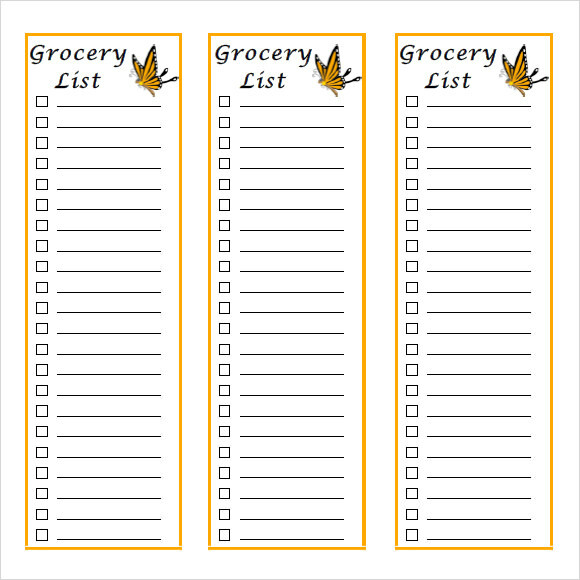 There is a check box in front of every line and an image of a yellow butterfly in the corner of each column. 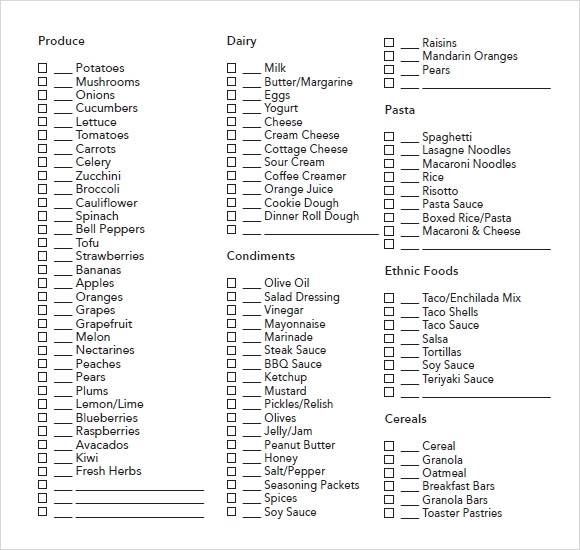 This sample of editable grocery list template is a perfect example of simple, yet very well managed grocery list. It starts out by dividing all the items into various subsections like fruits, vegetables, rice, milk, poultry etc. Against each subsection there are number of columns and each column has a go and slow written on its side. The go symbolizes healthy food whereas slow indicates foods which should be consumed in moderation. 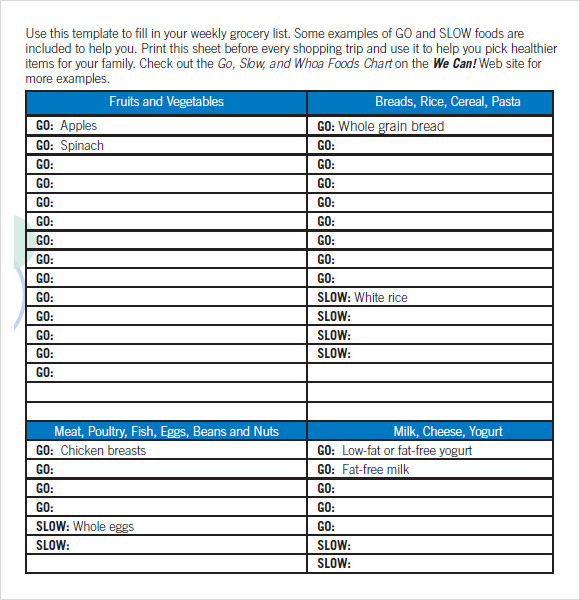 This sample of grocery checklist is a simple template, which makes the work really for any householder. All the items which are commonly used or required in any house are written down under different subheads and a checkbox is given in front of every item. All you need to do is check the relevant box in front of each item which is required. 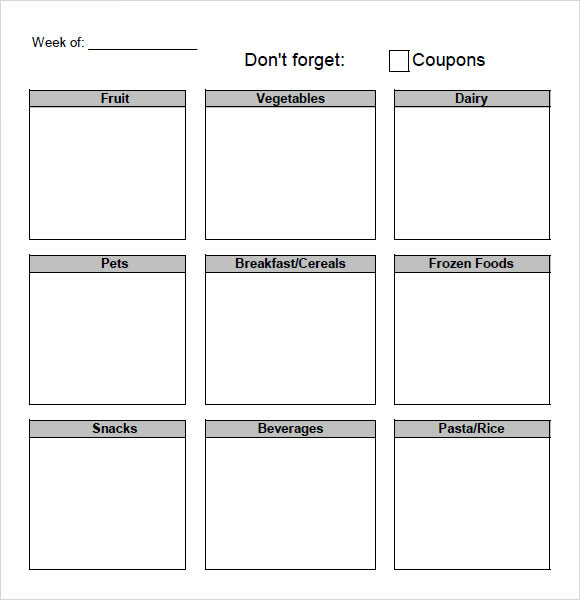 This sample of printable grocery list is a well designed and graphic template. The divides all grocery items into several sections like vegetables, dairy, meat, rice, whole grains and so on. There is a purple border on the side of the page with images of different vegetables which makes the template look visually appealing. 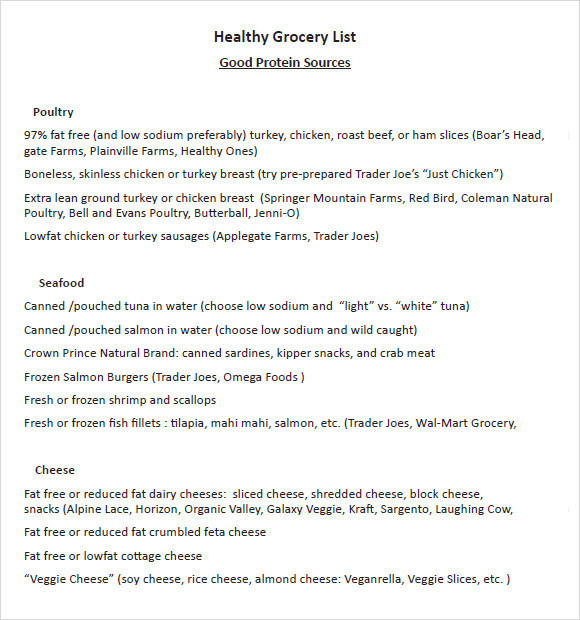 What Are The Items Which Should Be Included In A Healthy Grocery List? Creating a healthy grocery list with the right amount of mix is vital to ensure that you eat well and stay healthy. Shop for more fresh fruits instead of processed foods. Include lean proteins like chicken instead of red meat. Instead of rice and paste, opt for brown rice and whole wheat breads. Reduce the intake of sodium in your day to day food. Sodium is present in large quantities in packaged food items, which in turn spikes the blood pressure levels in a person.You can also see Project List Templates. How to Manage Your Grocery List in the Best Possible Manner? 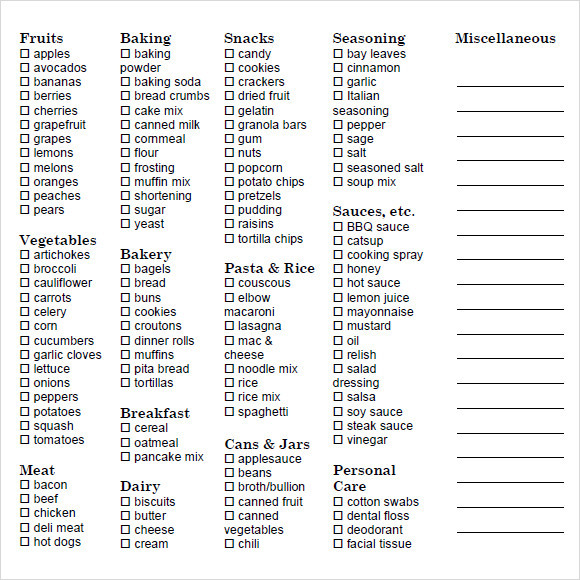 A grocery list is a very handy tool, which can make life really easy. 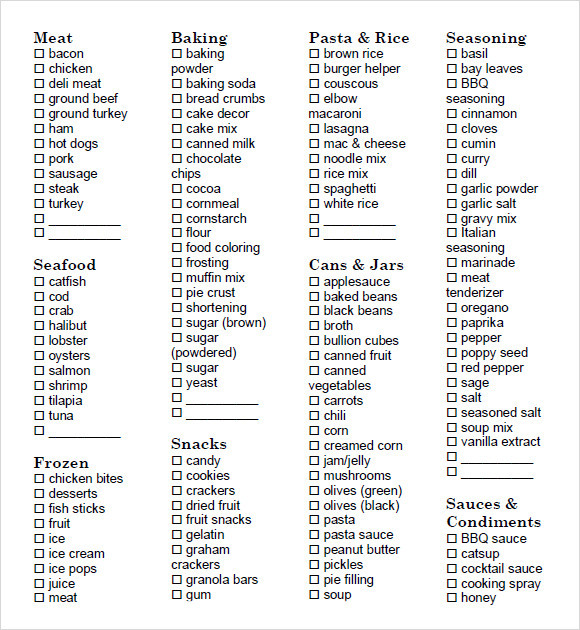 A simple method of using this list is to take several printouts and stick it in a convenient place in your kitchen. Whenever, you run out of any item, just tick it and half of your work is done. Make grocery shopping a bi-weekly or weekly job. This way you save a lot of time and effort and have all the required supplies. Do not go shopping when you are hungry. You are most likely to choose ready to eat items which have a lot of harmful side effects. Lastly always work on a budget. This way you shall be forced to abstain from buying tempting treats. How To Save Money While Grocery Shopping? One good way of saving money while grocery shopping is to buy products available from the store brands. Using vouchers and coupons can help you to get supplies at a lower rate. There are lots of items which go on sale during different time of the year. If those items can be stored away and used at a later date, it makes absolute sense to buy them in bulk. You can download our free Sample List Templates, examples and templates to keep track of all the requirements, fill them up and then carry them the next time you heed to the grocery store to ensure that you do not forget anything in the rush and buy from the best seller.You can also see Sample Shopping List Templates.